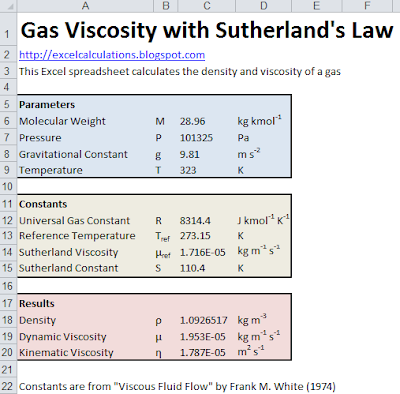 This Excel spreadsheet calculates the viscosity of gasses with Sutherland's Law. The spreadsheet contains constants suitable for air, but can be used for other gases. William Sutherland was an Australian scientist who studied the temperature-dependence of ideal gases. In 1893, he developed an empirical-theoretical relationship between the temperature and viscosity of an ideal gas. Essentially, the method uses a known reference viscosity and temperature to find another viscosity at a specified temperature. The molecular weight of air, for example, is 28.96 kg kmol-1. Sutherland's Law is accurate for moderate temperatures and pressures, and also describes the viscosity-temperature relationship of gasses at hypersonic speeds.